JK Findings maintains a corporate recycling policy which includes returning ALL paper, cardboard, plastics, cans and bottles to local recycling centers. All printer cartridges and cell phones are returned for remanufacturing and reuse with proceeds from the return going to charity. 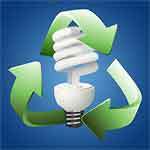 Fluorescent light bulbs are taken to an approved recycling center for proper disposal. JK Findings pays a government approved Computer and Electronics Recovery Center to take all old computers and electronics for recovery of parts and metals thus minimizing the disposal of hazardous electronics in landfills. Filtered drinking water systems are installed in our facility providing for both a reduction in water bottle waste and healthier drinking water for our employees. At JK Findings, we make it a habit to use only nontoxic cleaning products and air fresheners to reduce indoor air pollution. Materials and chemicals used in production are regularly evaluated to ensure compliance with applicable global registration, hazard communication and waste handling and disposal requirements. Low flow toilets in our facility restrooms save thousands of gallons of water every year. Waste Water Filtration We invested in a sophisticated waste water filtration system in order to minimize the output of potentially harmful chemicals such as cyanide, cadmium and lead. As a result of this effort, analytical tests performed by the Department of Environmental Services have shown that our wastewater chemical content falls well below the government industrial discharge limits. In addition, it is very important to local municipal water treatment facilities that the content of silver in the waste stream be very low because silver destroys the good bacteria necessary to properly treat the water. Our filtration system also reduces the measured concentration of silver to a negligible amount, well below the discharge limit for silver. We highly recommend our wastewater filtration system to any manufacturer that has made protecting the environment a high priority. Learn more about our system and its applications here. Virtualization of our servers and associated storage disks has greatly reduced hardware requirements and the related energy use previously required to power multiple servers and cool the environment. High efficiency HVAC systems and programmable thermostats have been installed throughout our entire facility ensuring optimal, energy conserving temperatures are maintained whether we are open for business or closed. T-5 fluorescent fixtures are utilized throughout the building providing the most energy efficient lighting available. Smart-circuit power strips are utilized throughout the building saving significant energy when computers, peripherals and other electronics are not in use. We buy only Green Silver for use in our production process. See our Green Silver Certificate. (Requires Adobe Reader, a free download.) This silver is not supplied by any aspect of the mining industry! Our accounting department has gone paperless, now storing all customer and vendor records electronically. Customer invoices and statements are forwarded electronically replacing mailed paper copies. Company wide communications are handled electronically whenever possible utilizing emails and scanned documents rather than fax and mail systems. All bathrooms are equipped with Xlerator hand dryers eliminating paper towel usage while also providing for maximum energy efficiency available in a hand dryer. With the help and cooperation of our vendors and customers, sustainability is our way of doing business at JK Findings.